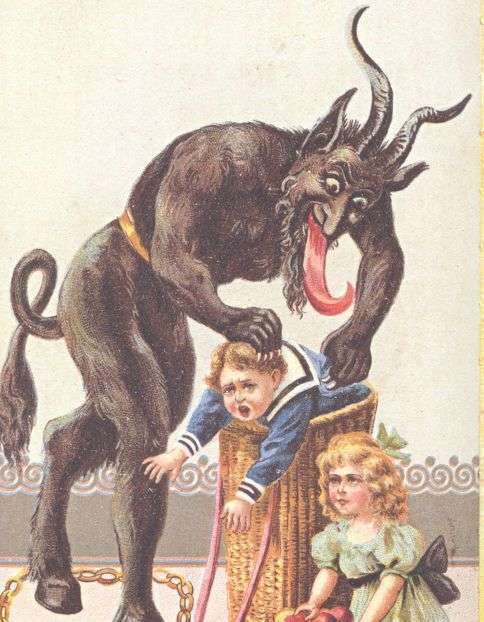 1d12 Days of Christmas, Days 3 & 4 – A double dose of Krampus! Looks like I let a few days slide by whilst preparing for Christmas festivities in the Walton household. Sorry about that, kids. To make up for it, here is a double dose of Krampus freebie goodness! First up is Krampus Race, a mini holiday boardgame you can play with the whole family! Sure, it pretty much has all of the strategical opportunities of Candyland (or Driedel, for that matter), but who can resist a game where you’re snatching up naughty children to punish? Get your copy at DriveThruRPG. Next is The Shadow of Krampus, a supplement for the excellent Macabre Tales horror RPG. For those who aren’t aware, Macabre Tales is a Lovecraftian horror RPG for one player and a GM that uses dominoes for task resolution (read my review here). This mini supplement puts Krampus in a Lovecraftian context, stats him up for MT, and has a handful of ideas for bringing our furry friend into your game. A great little supplement that you can use in any horror game, not just Macabre Tales. Get your copy at DriveThruRPG. That’s all for now! Remember to be good, or you might hear some cloven hooves on your doorstep this Christmas Eve!